Liveaboard diving opens up a new world of dive adventures and remote destinations that few people visit, but it can be tricky to know where to start when navigating the variety available. Thankfully there are liveaboard options to suit every type of diver; from new and intermediate divers wanting to enjoy peaceful coral reefs, right through to experienced divers looking for a new challenge in the big blue. There are a plenty of liveaboard destinations suitable for new divers. Whilst it may be daunting considering a liveaboard vacation as a new diver, don’t let that hold you back. Liveaboard staff will help you all the way and you’ll build up some valuable dive experience at fantastic dive destinations. 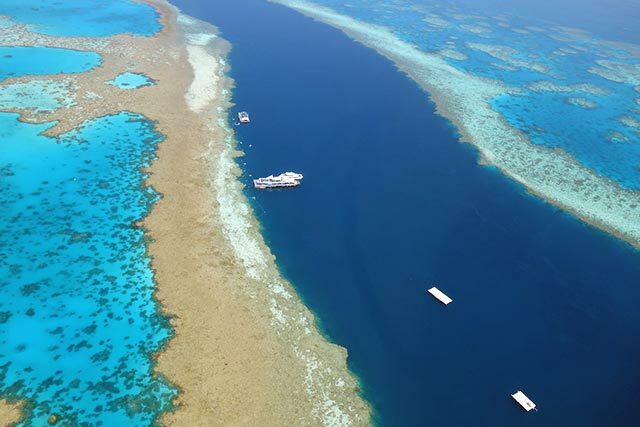 The Great Barrier Reef, stretching for 2300 kilometres along the coast of Queensland, is perfect for new divers. There are numerous Great Barrier Reef liveaboards to choose from and many don’t require a minimum number of dives to participate. With water visibility averaging over 40 metres in the Coral Sea and diverse marine life at numerous sites, this area of Australia is an ideal introduction to liveaboard diving. The Bahamas is known for easy and consistent dive conditions, making it perfect for new divers and especially those who love sharks. Divers can join a Tiger Beach Liveaboard off Grand Bahama and enjoy dive sites as shallow as 6 m depth, with little or no current, and plenty of tiger sharks. The Bahamas Aggressor offers Bahamas Tiger Beach safaris and requires Open Water certification with no minimum logged dives. October to January are the best months to visit for peak tiger shark season. Intermediate divers can enjoy a variety of destinations that offer relatively easy diving conditions and a variety of marine life. The Red Sea is an ideal destination for a variety of experience levels and offers warm water, great visibility and colourful marine life. There are plenty of wrecks to explore, plus the chance to see dolphins, Oceanic whitetip sharks and colourful coral reefs. If wrecks are your top priority, the Emperor Superior offers ‘Get Wrecked’ itineraries focused on the wrecks of Abu Nuhas, the ‘ships graveyard’. This submerged reef is famous for its wrecks; the Giannis D, Kimon M, Chrisoula K and Rosalie Moller. It is also home to the oldest shipwreck available to divers in the Red Sea, the 1869 Carnatic. Indonesia liveaboard diving offers the chance to explore some of the best dive sites on Earth. Home to an astounding amount of coral and fish species, there is certainly something for every diver here! Komodo scuba diving offers thrilling drift and current diving, plus the chance of close encounters with large numbers of manta rays, whereas Raja Ampat liveaboards offer fantastic exploration dives with few other boats around. Wherever you choose to dive in Indonesia, it’s a good idea to have experience with diving in current and from a tender or zodiac. If you have a good number of dives under your belt, the world really is your oyster. There are numerous destinations to choose from and you can go just about anywhere for your next dive holiday. This diving mecca is best suited to experienced divers comfortable with negative entries, strong currents and deep cool waters. The conditions might be challenging but the marine life is diverse and rewarding. Depending on the time of year you visit, you can find yourself surrounded by schools of hammerhead sharks, Galapagos sharks, whale sharks, huge schools of fish, manta rays and more as you drift in the blue. 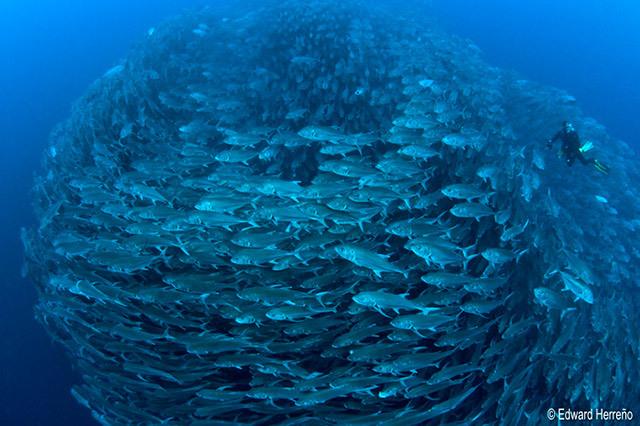 Galapagos scuba diving is a melting pot of nature’s finest experiences and is not to be missed. Cocos Island is synonymous with schooling hammerhead sharks and is a wish list trip for any experienced diver. This marine park is only accessible by liveaboard diving and is rated as one of the best dive destinations in the world. The Undersea Hunter offers 10-night safaris to experience the best dive sites and abundant marine life ranging from huge schools of fish to dolphins, sailfish and more. Read our guide to the best liveaboard destinations for every diver to find out more.